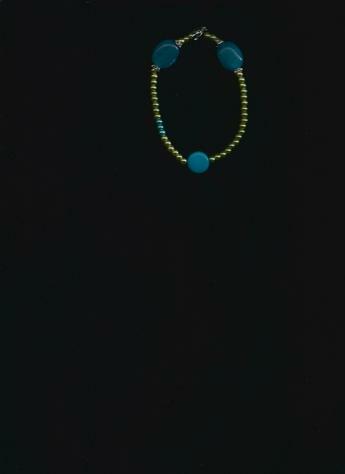 Aqua Blue and Yellow beaded Bracelet. Dark Aqua Blue acrylic round beads, with alloy Rhinestones & yellow pearls (faux) and blue pearls (faux) seed beads, on silver-plated wire, with a silver-plated clasp bracelet. *(EXPEDITED SHIPPING EXTRA.) SHIPS USPS, UNLESS OTHERWISE SPECIFIED. 30-day Money Back Guarantee. Conditions apply. *BLR FASHION JEWELRY is an Ohio-based business. We sell Stylishly-Fashionable, Fun & Comfortable, Timeless & Classic fashion jewelry (necklaces, bracelets, chains, rings & fashion accessories.) We accept Money Orders, Paypal. No cash or personal checks. FASHION JEWELRY FOR ANY AGE FASHIONISTA! FOR ANY TIME OF THE YEAR! Dark Aqua Blue round beads, alloy Rhinestones silver-plated clasp bracelet. VERY NICE FOR "SOMETHING BLUE" WEDDING! Dark Aqua Blue acrylic round beads, with alloy Rhinestones silver-plated clasp bracelet.